We've all seen it, we've all laughed. But the truth behind the staple of 'amusing' football footage is far more sinister. On June 22nd 1974 Brazil were cruising to victory in a World Cup group match against already eliminated Zaire. It was a match that was meandering out to a predictable conclusion but as Rivelino and Jairzinho dithered over taking a free kick, an incident occurred that turned the game from a footnote in world cup history to one of its most famous encounters. If Mwepu Ilunga had received royalties every time the footage was shown of him sprinting from the defensive wall to launch Brazil's untaken free kick up field he would be a rich man and while the incident itself is common knowledge the story surrounding it is less so. Unfortunately the theory that has lingered for all these years, that an African player was so uneducated on football's rulebook that he didn't realise what he'd done wrong is as erroneous as it is condescending. Zaire's contribution to world sport in 1974 is normally associated with hosting the heavyweight boxing clash between Mohammad Ali and George Foreman, billed as the Rumble in the Jungle which took place in the capital of Kinshasa in October. While the boxer formerly known as Cassius Clay would amaze the world with his rope a dope tactic, he himself had claimed to have been amazed by the performances of Zaire's national football, one of the main reasons he said that he wanted to bring the fight to Kinshasa. While Ali was a frequent visitor to Africa its more likely that he was simply attempting to win a PR battle and gain the affections of the home crowd. A more plausible scenario is that the 2 fighters were simply attracted by the offer from Zaire's president Joseph Mobutu. His fight purse of $5 million dollars to each pugilist to stage the fight in his country was far more than they would have received in America. As a former sports journalist Mobutu felt proud of this coup but he could also revel in the achievements of another of his interests, the Zaire national football team. Despite the squad being completely amateur and banned from playing abroad, Mobutu had promised the players incentives in the shape of cars, houses and holidays abroad if they managed to qualify for the 1974 world cup being held in West Germany. The offer seemed to spur them on and they duly qualified becoming the first African team to do so since Egypt participated in the 1934 event. Despite this success only some players received cars and small villas, while the lavish holidays never materialised, it was a precursor to what was to follow. Drawn in a group alongside Scotland, Yugoslavia and Brazil they headed to Germany as the African Cup of Nations champions, defeating hosts Egypt on their way to the title. A large part of this success was down to the standout performances of their dynamic forward pairing. Adelard Mayanga was nicknamed "The Brazilian" due to his dribbling ability while Mulamba Ndaye managed to set a longstanding record in the tournament by scoring 9 goals. Despite this, watching Scotland manager Willie Ormond was unimpressed, "If we cannot beat Zaire then we should pack up our bags and go home." Although Scotland didn't need those early flights, Zaire did play well in the opening group game and created enough chances to give Scotland a scare or two before going down to a 2 0 defeat thanks to goals from Peter Lorimer and Joe Jordan. Unfortunately this promising start would descend into farce. Zaire's entourage at the world cup was huge and was made up largely of various government ministers and their respective hangers-on. While banned from the dressing room before matches they were able to dip into funds that had been ring fenced to be used as bonus payments for the players. When the squad were informed after the Scotland game that they would not be paid they reacted furiously, even threatening a strike at one stage. Although this was averted and the players did appear for the 2nd game against Yugoslavia their performance was in marked contrast to their skilful, determined effort against Scotland. Strangely their Yugoslavian coach Blagoje Vidinic dropped Mayanga for the match and after going 3 0 down early on he replaced first choice goalkeeper Kazidi who had performed well in the first game, with 5 foot 4 substitute keeper Dimbi Tubilandu. By half time not only were Zaire 6 goals adrift they were also down to ten men after Ndaye had been wrongly sent off in a case of mistaken identity after Ilunga had berated the referee over a perceived injustice. The 9 0 full-time score, if anything, flattered The Leopards. When asked why he had taken off their best keeper during the match Vidinic replied that the reason would remain a "state secret", fuelling conspiracy theories that ranged from Vidinic wanted his home country of Yugoslavia to rack up a big win to boost their goal difference to government officials pressuring the coach to pick Tubilanda who had friends in high places. “After the match he sent his presidential guards to threaten us. They closed the hotel to all journalists and said that if we lost by 4 goals to Brazil, none of us would be allowed to return home"
A few days later came the Brazil game, and THAT free kick. Already 3 0 down and with 85 minutes on the clock Mwepu and the rest of his team mates faced the very real possibility of another heavy defeat, and with it the prospect of government retribution. When taken into context Mwepu's sprint from the defensive wall looks less like a comedic lack of knowledge and more like a panicked attempt to waste time from someone who was unsure if he would be allowed to return home or indeed what he would face when he got there. While most clips of this moment are normally packaged in some kind of "football's funniest moments" montage it is quite the opposite. It is an example of what can happen to players when their football becomes a plaything of a despotic ruler. 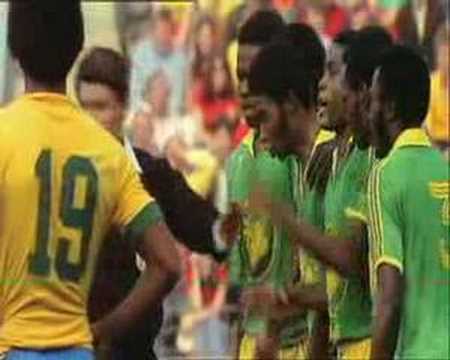 The money that was promised to Zaire's squad was never paid, and the players, feted by Mobutu before the tournament was quickly forgotten about on their return home. The government stopped funding the national side and they would never again challenge for African honours or world cup qualification. Most of the players lived the rest of their lives in poverty, banned from taking their talents overseas to play for wealthy foreign clubs. Ndaye Mulamba arguably Zaire's most talented player at the time made it as far as South Africa where for a while he scratched an existence begging on the streets. In 1998 a minute's silence was held in his honour at the African Cup of Nations after it was reported he had died of a gunshot wound, this was a surprise to Mulamba who was recuperating in a Cape Town hospital at the time very much still alive despite receiving wounds when he was robbed. After recovering he went on to coach local teams and in an interview recently, explained why most African players fall into poverty when they retire. "In Europe they honour their footballers. Here, when you play they know you but when you finish they forget you." The path to Europe and its footballing riches were impossible to take for Mulamba and his team mates in 1974 but his words show why it is so sought after by today’s African generation. You can follow Shaughan on Twitter here & read more from him at his blog.